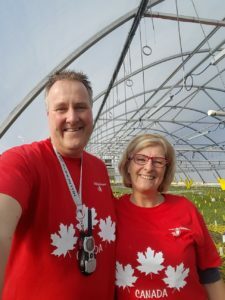 Home | High Q Greenhouses Inc.
High Q Greenhouses Inc. is an independent, progressive commercial greenhouse, owned and operated by Michiel and Ina Verheul. High Q Greenhouses Inc. began operating in the spring of 1988 and we have enjoyed growing Young Plants for commercial greenhouses and finished products for urban areas including Cities, Towns, Parks, and Golf Courses across Western Canada. We presently boast a combination of gutter connected and freestanding greenhouses that bring our total space to 60,000 sqft. Our Young Plant line up is sophisticated and diverse in all aspects of cultivars, plugs and liner trays, a true selection of healthy and vibrant colors. For those urban and type areas, we custom grow excellent colorful finished bedding plants, hanging baskets and planters in a variety of colors and sizes to create maximum curb appeal. As business continues to grow, we continue to invest in upgrades and strive for improved methodology and quality materials to continually serve you better. High Q Greenhouses Inc. is a Root and Sell Station for Selecta One and the Western Canadian distributor of Nature's Source Plant Food. A liquid form of fertilizer that is organic based in a formulation that fertilizes plants from start to finish. Available for commercial greenhouse growers and their customers. View pictures and order on line!